Crazy straws were always more fun than those straight ones. Even the bendy ones. I want color, pizzaz! My fave, fave, fave thing to do was drink milk with my crazy straw in my Underdog glass. I just stopped doing it last week. My kiddos love these as much as I did! chocolate milk with crazy straws, ah that takes me back! LOVE THIS!!!!!! 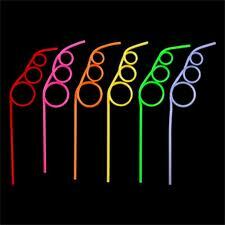 we just bought crazy straws for T's friend's for T's birthday party this weekend!!! i'll have to get a picture of all the girls drinking from them! how cute! i did like crazy straws too, however, i had a hard time cleaning them. i remember trying to clean them myself and thinking that if i put the dish soap directly into the straw that it would clean, however when i went to take my first sip in my "clean" straw, i just slurped up a big thing of soapy drink. gross. another time, i didn't clean it and the milk got moldy in the straw. dang crazy straws. ;) i was so young back then! We have an entire drawer full of crazy straws. Some of them are even from when my brother and I were kids. In fact, I think I'll go grab one right now! I love(d) crazy straws. But I remember that we had some that you re-used. And I have to question how clean the dishwasher got those loop-de-loops. Ick. Grown-up Alison is bothered by this. A lot. Oh my god!!!!! The 2 mini CB's LOOOVE them! I'm so old, I remember wax coated paper straws lol but I do remember when plastic bendy straws came out. Boy weren't we excited hahaha... Hiya Ally, happy Tuesday! My kids liked Krazy Straws. Hey, I used one with them. I forwarded the link to my daughter, I bet she will be get some for her daughter. I NEED a crazy straw!!! Now! Yep. Had a first grader bring them in just the other day. I love crazy straws!!! Recently, I purchased aluminum(IDK some metal...) straws from 7/11 and OMG. It was friggin great. I love them. Its so cold! I enjoy them frequently. You should try em. These are fun but very annoying when you are thirsty. Reminds me of Six Flags! I can't tell you just how much I loved these things as a kid…and those bowls with the straw built in…I think they were called sip-a-bowls. Man, those were the good, old days. Oh, crazy straws, most definitely cool. The only problem is that you have to rinse them immediately, or they grow mold. Yuck.